To print the image below, click on it. It will open in a new browser window. Use your browser's print command to print it from there; then close the standalone window, being careful not to exit your browser program. Perfectly coiffed and made up, wearing a whistle lanyard that looks like a string of pearls, gold earrings and beautifully done nails; try to imagine her refereeing a soccer match. I don't think so. 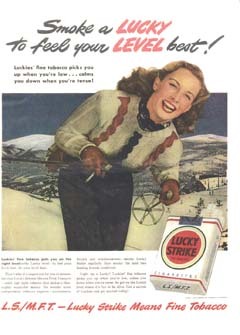 Perhaps the best analysis of advertising's effects on women has been done by Jean Kilbourne. Her book Deadly Persuasion: Why Women and Girls Must Fight the Addictive Power of Advertising (renamed Can't Buy My Love for the paperback edition) is must reading. Her videos are quite persuasive and powerful, but probably won't be shown on TV any time soon. 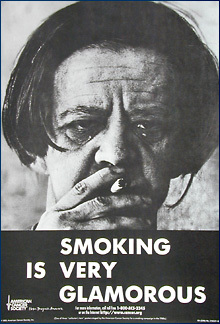 In May 2002, the American Legacy Foundation began a campaign to convince women smokers to quit. The web site associated with it is full of facts to examine, and stories to consider. It is definitely worth a look. In recent years, a former cigarette ad model, Janet Sackman, who lost her voice to cancer, has begun to speak out about the dangers of ads such as those in which she appeared. Her story has been posted on the web. (Scroll about 1/4 of the way down to the Sackman story.) From that posting I have culled an ad for which she modeled. Finally, the American Cancer Society produced a set of anti-smoking posters to illustrate the effects of cigarette smoking on people in the real world. The top poster below is one of them. Compare it with the other two images. After carefully looking at people in your community, which best depicts the long-term women smokers you see? copyright © 2001-2012 classroomtools.com. All Rights Reserved.